Happy New Year and best wishes for a year of fun and successful decorating plans and projects. I have a few lined up that I can’t wait to get started on – stay tuned for updates and pics throughout the year! In the meantime, it’s Christmas decor clean-up and the opportunity to sort through the Christmas items to decide what to keep, discard or donate. And now that all of that is behind us, we often look forward to calmer, uncluttered spaces in our homes. 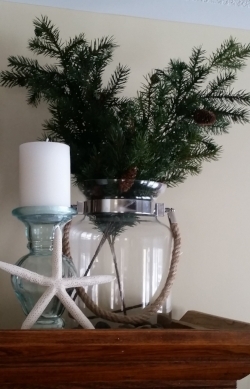 While it is far too early to decorate for spring which is a loooong way off for those of us surviving the cold, snowy winter in the northern hemisphere, what can we do to decorate for the winter season now that the holidays are behind us? Read on for my ideas and suggestions for transitioning to winter decor in our homes in this post-holiday period. 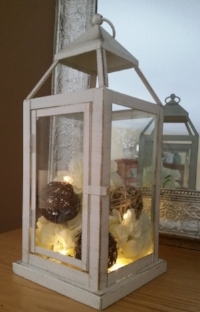 I love lanterns for their flexibility - they can be used anywhere in your home and the wide variety of styles, colours and finishes available make them suitable for any decor. The addition of candles brings a soft, warm glow; decorative filler adds colour, texture and pattern; mini lights around a candle or mixed in with the decorative filler add sparkle; and decorative spheres, like the filler, bring colour and texture to your space. I can’t get enough mini lights! 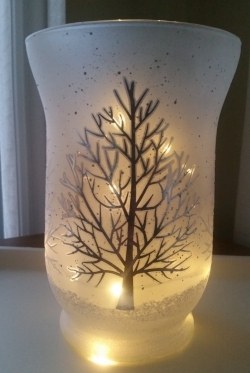 They add a bit of sparkle to any decor and can be used on wreaths, in lanterns, wrapped around candles or inside a bottle or jar for a simple and easy update. What a perfect way to add a bit of light, glamour and ambiance to your rooms! Natural items such as pine cones, nuts, branches, evergreen boughs, etc. add an earthy element and ground our decor. During the shorter days and longer nights what a comforting way to bring the outdoors in and add an earthy, relaxed vibe to your rooms. The green of pine, boxwood or plants bring harmony and balance to our rooms and is a simple and beautiful way to restore ourselves after the busy-ness of the holiday season. A bit of green in your rooms is restful and reassuring – the promise of spring! Nothing says cozy comfort like a woollen or faux fur throw and pillows. They add instant comfort and warmth as well as a relaxed vibe to any room and are close at hand when the urge to nap and ignore the raging storm outside hits us! 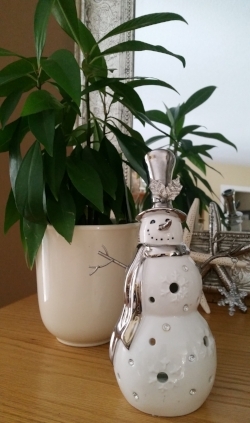 And of course I love having a bit of whimsy in my decor so keep the snowmen on display long after the Christmas decor is packed away. 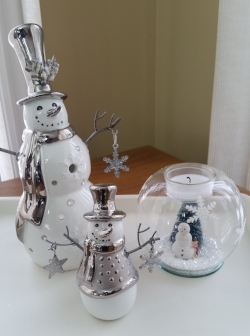 They make me smile, are a nod to the winter season and remind me of the snowman building adventures we had with our girls. I hope these suggestions are inspirational and give you some ideas for transitioning to winter decor. Enjoy the process!